Grand Meander is this weekend! Join us for a charitable crafting event! Saturday December 2 from 10:00 - 5:00. Craft & create to benefit others! Stop by to help us sew reusable tote bags, courtesy of Sew Good Goods, for Keystone Community Services food shelf. Sew Good Goods is a local non-profit that embraces the notion that in creating and giving hand-crafted goods a unique connection is made and shared. It's free to participate! Stay a few minutes or a few hours. All materials & machines provided. DON'T SEW? Please consider donating toiletries and personal care items to fill the tote bags. We will be collecting donations through the end of the day Sunday, December 3. 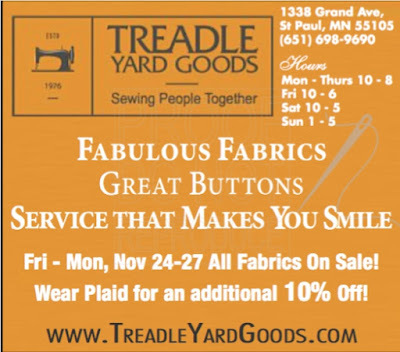 Plaid Friday & ShopLocal Saturday sale! All Fabrics on sale + Wear plaid for an additional off! Friday Nov 24 - Monday Nov 27. Another fantastic collection from Riley Blake, Neverland features scenes from Peter Pan! These adorable prints will leave you feeling filled with fairy dust! We have some breathtakingly gorgeous new velvets! These all feature designs that are either printed into the pile, formed with cut or burnout techniques, or both! Take a look! Riley Blake's new Meow collection features adorable kitties, balls of yarn, and yummy fishes, all on soft cotton broadcloth that's perfect for quilting, pajamas, or simple garments! Soft cotton chambray is like a lighter weight version of denim, perfect for shirts and dresses. The cool blues are ideal to pair with a warm brown autumn boot! We are currently hosting the Marcy and Katherine Tilton trunk show at Treadle! See original garments featured in their Vogue and Butterick patterns. It's your chance to get up close with a Tilton original! Stop in now for a look at this great collection! Stretch velvet is on-trend this season, and with rich jewel tones like these, you'll be perfect for winter! Use stretch velvet to add loads of luxe to any pattern that calls for a stretch knit. Glamorous dresses and tops are easy with this luscious fabric! Wrap up in organic cotton softness with these sweet flannel prints! It's flannel season! We have loads of great patterns in soft, brushed cotton flannel. Here's just a few of our current plaids! Use cotton flannel for shirts, pajamas, or jackets, like Julia's we shared last week! Wrap up in pure softness with these 100% organic cotton knits prints!